Sharjah Art Foundation presents the first retrospective of Anna Boghiguian. Encompassing four decades of the artist’s work, the exhibition brings together a comprehensive body of artist’s books, drawings, paintings, photographs and sculptures as well as large-scale installations. A recreation of the artist’s Cairo studio is also presented in Sharjah. 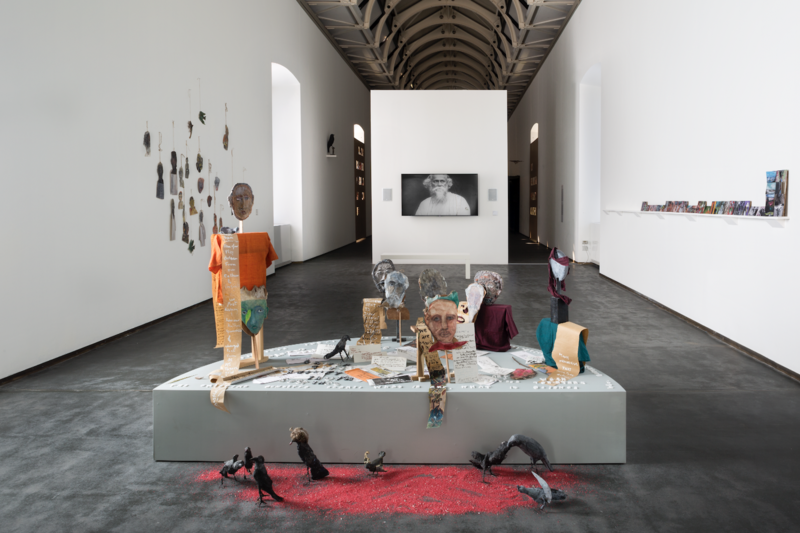 Organised by Castello di Rivoli Museo d’Arte Contemporanea in conjunction with Sharjah Art Foundation, Anna Boghiguian is co-curated by Hoor Al Qasimi, Director of Sharjah Art Foundation, and Carolyn Christov-Bakargiev, Director of Castello di Rivoli. Through bold colours and saturated compositions, Boghiguian’s paintings and sculptures combine materials like wax, wood and paint with cut-outs and collage. Her work also comprises photography, handwritten text, sound and site-specific installations that often derive from her observations of social and political conflicts. Many of Boghiguian’s works, such as paintings inspired by train journeys through India and Nepal and notebooks produced during stays in Canada and Egypt, draw from her experiences while travelling. For Boghiguian, travel marks a simultaneous separation and connection between places and times that she explores in rich detail throughout her work. Other series are informed by the lives of prominent historical figures, namely, poets and intellectuals such as Constantine Cavafy, Ahmed Shawky, Rabindranath Tagore and Friedrich Nietzsche. Among the exhibited works are Boghiguian’s multimedia installations The Studio, originally presented at Castello di Rivoli in 2017; Promenade dans l’inconscient (Walk in the unconscious), originally presented at Carré d'Art, Nîmes in 2016; The Salt Traders, originally presented at the 14th Istanbul Biennial in 2015; A Play to Play, originally presented at Iniva, London in 2013 and Unfinished Symphony (2011–2012), originally presented at dOCUMENTA (13) in 2012, as well as the drawing series A Poet on the Edge of History (Constantine Cavafy) (1995–2017) and a large selection of illustrated artist’s books (1981–present). Originally co-curated by Christov-Bakargiev and Marianna Vecellio, the exhibition is on view in Sharjah following its original presentation at Castello di Rivoli Museo d’Arte Contemporanea, Rivoli, Turin from 19 September 2017 to 7 January 2018. The artist’s work has been presented in numerous solo and group exhibitions, including Woven Winds, Index–The Swedish Contemporary Art Foundation, Stockholm (2017); Unfinished Conversations: New Work from the Collection, Museum of Modern Art, New York (2017); The Restless Earth, Triennale di Milano, Fondazione Nicola Trussardi, Milan (2017); A Walk in the Unconscious, Carré d'Art, Nîmes, France (2016); The Unfaithful Replica, Centro de Arte Dos de Mayo, Madrid (2016); SITE Santa Fe, US (2016); 14th Istanbul Biennial (2015); Positions #2, Van Abbemuseum, Eindhoven, The Netherlands (2015); Armenian Pavilion, 56th Venice Biennale (2015); Cities by the Rivers, SBC Gallery of Contemporary Art, Montreal (2015); dOCUMENTA (13), Kassel, Germany (2012); Sharjah Biennial 10 (2011); A Journey to Cavafy’s Alexandria, Benaki Museum, Athens (2010) and 11th International Istanbul Biennial (2009). Her work for Sharjah Biennial 10, The Simple Affair that Moved the World (2010–2011), was commissioned by Sharjah Art Foundation. Winner of the Golden Lion for the best pavilion (Armenia) at the 56th Venice Biennale (2015), the artist also took part in the travelling exhibition Contemporary Arab Representation, 50th Venice Biennale (2003) and was a finalist for the 8th Artes Mundi award (2017). Born in 1946 in Cairo to an Egyptian-Armenian family, Boghiguian is currently based in Cairo but is continually travelling to other destinations across the world.